What’s the Best Toenail Softening Cream for Thick or Hard Nails? Toenails can become hard due to health conditions and lifestyle choices. Our nails also harden and become thicker as we age. The good news is that there are toenail softening solutions that make life easier. A fungal infection can cause hard, thick, and brittle nails. If you discover that a health problem is causing tougher toenails, combine a softening treatment with a proven antifungal cream. Don’t avoid treatment as it won’t go away on its own. Once you start using a toenail softener, you should keep your nails cut short and straight across. This will help to prevent things like fungal infections from spreading, as well as ingrown toenails. Clipping hard, thick nails can be painful, and it can also increase the risk of infection. If you have toenail fungus, psoriasis, or ingrowing toenails, allowing the topical medication to soak in is essential. Softening your nails and keeping them trimmed can prevent further medical complications. In this article, we’re going to look at the best products and provide an easy-to-follow guide for getting results. We’ll also look at the ingredients and possible side effects. Our top pick is Miracle of Aloe Toenail Soft. It’s easy to apply, and it delivers overnight results. 3 How Do Softening Creams Work? Toenail softeners are designed to penetrate hardened nails. Some are overnight soaking solutions. Others may take up to a week before you’re able to see and feel the difference. While using a toenail softener provides easier-to-cut toenails, not all products are created equal. Certain creams get better results than others. If you use a cream that doesn’t work immediately, continue to use it until you see a noticeable difference in the hardness of your toenails. Don’t attempt to trim your nails after one application, unless they have softened them significantly. Consider these toenail softener reviews a great place to start when seeking out the best solution. First, let’s look at how to prepare your toenails and get the fastest possible results. Pour enough warm water to cover your feet into a tub, basin or foot spa. Add 2 to 3 Tablespoons of salt. Soak your feet for 30 minutes. Soak them for longer if your nails are very thick. Pat your feet and nails completely dry once you’re finished. Apply a good nail-softening cream. Soaking your feet beforehand can allow the cream to penetrate further into the nails. If you want to benefit from a nicer experience, you can use the best electric foot spa machine. That can help it to work faster, so you can clip your nails quickly and easily. How Do Softening Creams Work? Most softening creams work by hydrating the toenails. They contain ingredients to penetrate through tough nails and hydrate the nail itself, as well as the surrounding skin. That’s why many products require you to use them before bed. This allows the product to soak in overnight, so your nails will be softer in the morning. Many creams will also contain ingredients, like aloe vera or tea tree oil, to help fight against certain foot conditions, like toenail fungus and ingrown toenails. Contact a doctor if you experience a painful burning sensation. Additionally, seek attention if you feel you experience an allergic reaction. How your feet react will depend on if your nails and surrounding skin have been compromised by a medical condition. The Miracle of Aloe is one of the most popular toenail-softening agents. It uses a formula that consists of 60% aloe vera. This helps to add moisture to the nails. To get results, simply rub the cream on your toes and let it sink in overnight. It creates a temporary softness that allows you to easily cut off fungal nails when you wake up. You can continue to apply the cream, as needed. Toenail Soft also contains a few nourishing oils, including tea tree leaf oil, which can also help in dealing with fungal infections. Not only does Miracle of Aloe work for thick, hardened nails due to fungus, but some people use it for ingrown toenails. Softening nails and making them easier to cut is important for both conditions. It helps to prevent the discomfort associated with clipping hardened nails. With a good rating on Amazon, it’s clear people dealing with hard nails are happy with how well it works. Check the Current Price of Miracle of Aloe Toenail Soft on Amazon! This cream uses the hydrating power of water and tea tree oil. Sally Hansen Toenail Softening Cream works best when applied overnight. Rub a sufficient amount of cream over your toenails. The key mineral oils will help to penetrate deep into the nail. Letting the cream soak in overnight will help to produce softer nails in the morning. People with especially thick nails may need more than one application to achieve enough softness to clip them. You can continue to use the cream as needed. Feedback has been a little mixed for this product, so we don’t recommend it. If you have toenail fungus, keeping your nails trimmed is important. Unfortunately, one of the side effects of a fungal infection is thick, hard, and brittle nails. Not only are they unsightly, but they can do more harm than good. That’s why you need the best tough toenail clippers. If you don’t have your own pair (don’t share them with members of the family), we recommend looking at our in-depth guide. A softening cream can help to penetrate through tough nails, so you can keep them clean and trimmed. While a toenail softening cream can make them easier to treat, the cream itself is not a treatment for fungal infections. Creams, like Miracle of Aloe Toenail Soft, aren’t known to cause other medical complications when combined with other medications. However, if you’re using another ointment for toenail fungus, use it at different times for best results. This will allow each type of medication to penetrate the nail fully and do its job. What’s the Best Toenail Strengthening Cream? 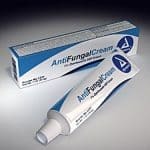 Will Antifungal Cream Cure Toenail Fungus? Is Xolegel or Ketoconazole Cream for Toenail Fungus Effective? Does Lamisil Cream Cure Toenail Fungus?